Approximate Measurements: 6”, (7) circumference x 8”, (8 ½) long without stretching. 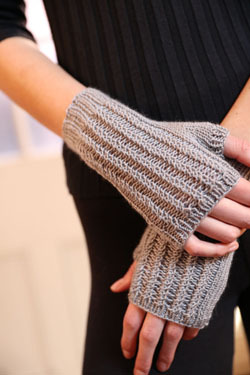 Mitts will stretch considerably due to the yarns’ elastic properties. Gauge: 24 sts, 32 rows = 4” using US size 4 (3.5mm) needles in st st after blocking. Needles: US Size 2 (2.75mm) and 4 (3.5mm) DPNs, 3 st markers (m)- 2 in one color and 1 in another, 2 st holders.